The consumer packaging cycle typically sees various designs fall in and out of favor, as new technology and innovation change prevailing standards. Glass milk bottles, for example, gave way to plastic versions once the ability to create molded plastic jugs became widespread and affordable. Easy-open cans, with tabs or pull-tops ultimately took over for those needing openers, reflecting the packaging capabilities and consumer demands of the time. And coffee, once packaged almost exclusively in familiar tins, is now brought to market in bags, pouches, boxes, and various styles of flexible packaging. The impact of technology is felt across the entire consumer supply chain, so shifts in coffee packaging methods provide examples of the way innovation changes the game for producers, marketers and packagers. Why were store shelves once stacked high with coffee tins? The answer: Because coffee drinkers grew accustomed to the standard, which aptly addressed their desire for fresh-tasting coffee. Today’s coffee connoisseurs, on the other hand, use better brewing methods and often prefer to buy whole beans to grind their own coffee at brewing time. As a result, the diminishing numbers of tin cans in the coffee aisle are increasingly replaced by progressive new coffee packaging alternatives, which respond to modern coffee drinkers’ needs. Demand drives innovation, so packaging companies continually change their approaches to serve evolving consumer insistence. And as technological breakthroughs and improved materials make more things possible, packagers draw from an ever increasing arsenal to push industry standards forward. The dawn of vacuum-packing, for example, made it possible to keep coffee fresh for longer periods of time. In fact, the familiar sound of releasing vacuum pressure ultimately became associated with breaking the seal on a fresh can of coffee. From the turn of the century forward, vacuum tins furnished a reliable approach for packaging coffee. With air removed from contact, coffee tasted better, which cemented canned coffee’s place on the retail landscape. Coffee packaging didn’t see significant changes until plastics advances were made in the 1960’s. Specifically, the ability to laminate plastic layers into durable flexible bags changed the playing field for packagers and producers. Depending upon the layers incorporated into each package, the flexible pouches keep coffee protected from oxygen and light, making them ideal for freshness. Once outfitted with degassing valves to vent coffee roasting byproducts, side-gusseted pouches quickly became prominent on store shelves. 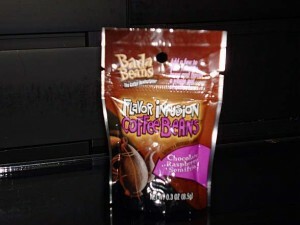 Gusseted pouches provide effective packaging methods for whole coffee beans, as well as ground coffee. The flexible, soft-sided bags often include a layer of foil, adding rigidity and strength to each package. When outfitted with a special one-way valve, the oxygen protected barrier pouches also allow gasses to escape, without letting air in to degrade the coffee. In addition to their effectiveness protecting contents, pouches are also easy to ship and display. Naturally, countless roasters have adopted flexible pouches as their packaging standard. But with so many similar presentations on the market, how do coffee producers set themselves apart? Brewklyn Grind – This roaster’s flashy packaging relies on local artists, forging a connection between the brand and its market. Though eye-catching, the locally inspired, art-infused approach actually simplifies the brand’s identity, by associating it with home. Ethical Bean – Like Brewklyn, this company uses bright, bold colors and graphics to depict a progressive image. But the roaster also steps-up its interactive presence by imprinting gusseted stand-up pouches with QR codes enabling coffee drinkers to track their beverage from bean to cup. Onyx Coffee Labs – Though similar to conventional versions, Onyx’s flexible coffee package is compact and squared-off. Hand drawn illustrations and text/graphics further set the cubes apart. Partnering with the right packaging company brings creative design ideas to life, as dedicated project managers orchestrate packaging campaigns from early conceptual designs to shelf-ready goods. What’s Ahead for Coffee Packagers? Stand-up pouches and gusseted coffee bags aptly serve their intended purpose, so they continue to represent the industry standard. Within the category, however, competition and commitment cause producers to emphasize unique aspects of their brands – including packaging. Eco-friendly packaging is increasingly important to consumers, so coffee businesses are taking note. Onsite coffee services, for example, are using recyclable and compostable cups and then carrying-over the same consciousness to eco-friendly carry-out packaging. In one case, Bird and Wild, a coffee roaster committed to production practices that don’t interfere with wildlife switched to renewable, compostable coffee pouches. Not only does the move generate less waste, but it resonates with the brand’s environmentally conscious customer base. The coffee landscape has changed, including the introduction of K-cups, pods and other brewing methods. The new platforms present opportunities for packagers, who furnish primary and secondary packaging for a growing range of coffee products. Environmental awareness has made it into the K-cup market as well, with recyclable versions available now. More than ever before, packaging speaks directly to individual consumers. For coffee producers, this includes highlighting information about the origins of beans as well as other messages from the brand. Interactive features are also making their way to coffee packages, including scannable codes enabling consumers to use smartphones to find out more about retail products. Multi-sensory packaging adds yet another layer of product personalization, using tactic cues to leave lasting impressions with consumers who handle the goods. Flexible packaging continues to gain ground, furnishing protection and merchandising support for countless retail products. Its presence in the coffee industry is well-established, with various styles of stand-up pouches utilized for ground coffee and whole beans. Since their introduction, gusseted soft-sided pouches have raised the standard for coffee freshness and in-store merchandising. And though the familiar coffee bags still dominate retail shelves, coffee continues to evolve. Modern packaging companies are now turning their attention to new coffee brewing platforms and responding to shifts in consumer demand. By making the most of technology and finding new ways to bond with consumers, packagers and producers continue to keep pace with coffee trends.